How can multiple containers be deployed so that they share the same namespace and IP address? Two or more containers may need to be logically isolated from other containers. 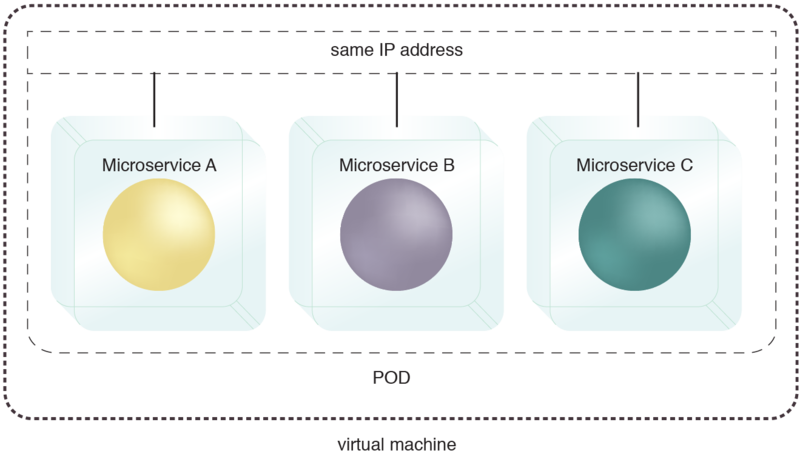 The isolated containers need to share the same IP address and cannot be deployed with other microservices on the same virtual or physical server to remain compliant with the required level of isolation. They cannot share an IP address with any other process or microservice outside of their logical boundary. A special logical container (called a pod) is deployed that can encompass multiple logical containers but has one IP address. The logical pod container is used to co-host multiple containers, allowing them to share the same IP address and file system, if required. The services are deployed in a logical pod container, designed to host multiple containers that can share the same IP address. The containers inside the pod can find and discover each other via the host that the pod is deployed on, and can communicate with each other using standard inter-process communication methods, such as shared memory. Containers deployed inside a pod can also share a filesystem, dataset or data storage device. A single pod deployed on a virtual machine allows the hosted services to share the same IP address. The pod can also be deployed directly on a physical server. This pattern is applied using a container engine, as explained in the complete pattern description.